This Ordinance requires streets that are designed and built to efficiently serve all users, including pedestrians, cyclists, transit riders and motorists. This project is important because it will make streets safer for all modes of transportation. 02/06/2015: After being unanimously adopted by the City Council on Jan. 21, 2015, O-14-27 has been signed by the Mayor. 11/24/2014 Abq Journal News Article "Sharing the Road"
This project focuses on street design for the entire city. Complete Streets are created to efficiently serve all users, including pedestrians, cyclists, transit riders and motorists. They utilize best practice standards that have been successfully employed in other cities around the country. Complete Streets techniques help high traffic areas be more inclusive of all forms of urban transportation, reducing congestion while making streets safer. Map Showing Central & Established Urban Areas Areas affected by the Proposed Complete Streets Ordinance, per §6-5-6-4 Applicability. How Will the Ordinance Work? The Complete Streets ordinance establishes a new city-wide goal to expand safe use of our streets by requiring equal consideration of the efficiency and safety of all types of travel. The ordinance will also adopt nationally-recognized standards for streets to serve existing and future development with appropriate infrastructure that encourages walkability and inviting public spaces. Major Reconstruction or Construction of New Streets – The City will consider all users when designing new roads or major rehabilitation projects, and will design infrastructure appropriate to those users and the surrounding development. Minor Maintenance, Resurfacing, or Rehabilitation Projects – The City will identify how Complete Streets approaches can be incorporated into more modest existing projects. Sometimes this may be as simple as changing the way a road is striped. It would also include closing unused curb cuts and narrowing overly-wide traffic lanes to provide right-of-way for sidewalks, bicycle lanes, on-street parking, or pedestrian buffers. What will this do for Albuquerque? Increase options for safe, comfortable travel to your favorite neighborhood destinations. Increased focus on serving both our residents and those who use our streets while still providing for safe and efficient travel. Improve community health by reducing risk of injuries and encouraging walking and bicycling to help combat obesity and heart disease. Increase livability by creating more attractive public areas. This will create public spaces that promote people’s health, happiness, and well-being. It will also foster private investment. Create inviting streets that encourage alternative modes of travel. This will help ease congestion and air pollution. Contribute to economic development, growth and stability by encouraging private investment and redevelopment in the areas where the Complete Streets approach is being used. 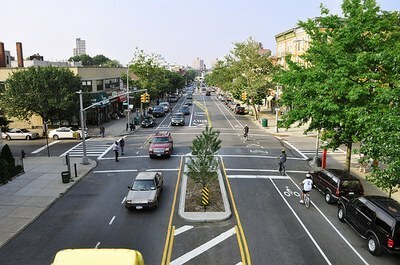 The Complete Streets Coalition website provides a comprehensive overview of the purpose, best practices, and outcomes of the Complete Streets approach.